“We founded Keystone Digital in 1997, 21 years ago, but we’re still working on our 20th anniversary celebration,” says Clint Green of North Pelham, co-founder and owner of Keyframe Animation Inc. and Krow-VFX Inc, with a smile. His comment speaks to how busy, and successful, this dynamic Niagara company is, and what a low public profile they keep. Within the special effects and animation community, however, they are very well known. Their clients include 20th Century Fox, Warner Bros, Marvel, CBCKids, Showtime, Dreamworks, History and Syfy Channels, and many more premier television and movie companies. The TV shows and movie titles they’ve provided animation and special effects for are highly recognizable successes: Lost Girl, X-Men, Dolphin Tale, The Expanse, Tudors, Vikings, Warehouse 13, Ollie – The Boy Who Became What He Ate…you get the idea. “Keyframe is the 3rd or fourth largest animation company in Ontario, Krow-VFX is the fifth largest special effects company,” says Darren Cranford of Niagara Falls, Green’s business partner and co-founder. There are some 60 such companies in the province. Cranford claims Keyframe/Krow-VFX has found the “special secret sauce.” According to Cranford, they’ve earned their place in the industry by bringing artistry back to animation and special effects, and by having an exceptional love for what their artists do. “Having an audience exit a show or movie saying, ‘Those were great special effects’ isn’t enough. We want them to say ‘Whoa, I’ve never seen anything like that before!’ Attention to detail is what audiences, and directors, remember,” says Cranford. Green relates a story about their involvement in the first X-Men movie, and working with now-famous director Bryan Singer. Both Green and Cranford were present with Singer discussing visual effects while an X-Men scene was shooting. Historically, scenes were shot on set with actors, and special effects were applied at some later stage. Green and Cranford suggested to Singer pre-visualizing (Pre-vis) the scene from the special effects point of view. Very simply, in skilled hands, 3D digital software can create animated sequences to illustrate what will happen on screen prior to shooting, vastly improving the planning and efficiency of shot-making during filming, generating a better final product and significantly reducing costs. “Singer sent everyone off the set, got Darren and I in a room alone with him, and asked us about our techniques and what we could do to improve the movie. I left after an hour or two, Darren left eight-and-a-half-months later,” said Green, referring to the fact that Cranford worked side by side with Singer for the filming of the movie. Modestly, neither Green nor Cranford mentioned that Singer won The Saturn Award for Best Director, given by the American Academy of Science Fiction, Fantasy & Horror Films, for X-Men that year. “It was like that when we worked with Kathryn Bigelow on K-19: The Widowmaker, the Harrison Ford movie. She had built the complete interior of the submarine with foam core panels, and installed little stick cameras all around it to get the shots. She was trying to create a claustrophobic feeling within the sub for her audience. We showed her how we could do it digitally in 3D instead. Darren spent five months on that production. We watched her take the foam core apart piece by piece,” says Green. Green and Cranford are both from Newfoundland, and first met at the Memorial University of Newfoundland, while attending Grenfell Campus’ School of Fine Arts. 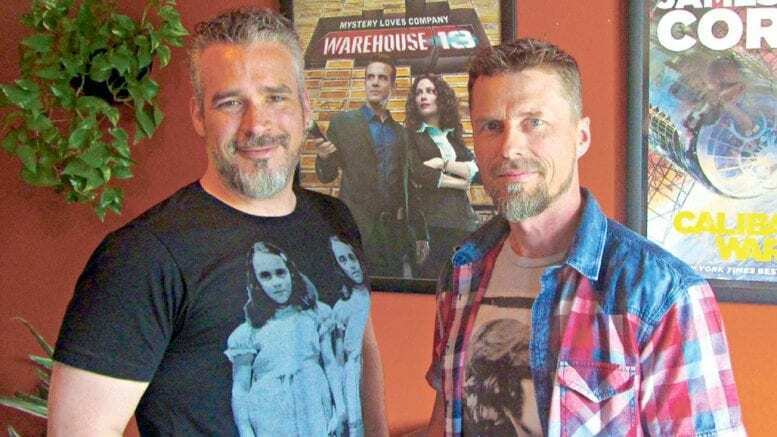 Conventional wisdom said they should be in Toronto, where the TV and movie production studios were, but they were drawn to St. Catharines instead. A visitor peers over the shoulder of Adarsh Peter, one of Keyframe’s skilled animators. He’s nestled between two large computer monitors, creating digital storyboards for an animated children’s video from nothing more than pages of typed script. For each page of script, Peter will need to generate about one minute of video. All the deftly drawn and painted “boards” required to complete the eleven minute video will take him between two and four weeks to create. Keyframe was first located in the Foster Wheeler building at Glendale Avenue and the QEW, but Green and Cranford came to recognize the advantages of moving to St. Catharines’ downtown core. In 2012 they purchased the Stella’s Nightclub building on King Street, and Keyframe was moved in 2013. The main-floor studio now includes a temperature-controlled server/render room, 8500 sq. ft. of open artist’s work area, and one of Stella’s original bars repurposed within their cafe. Add a 2000-sq. ft. mezzanine and another 10,000 sq. ft. in the lower level for which they have renovation permits approved, and Keyframe/Krow-VFX has ample space for their artists, with room to grow. He motions to one of the artists working below. Green himself is a photographer and installation artist, co-founder Cranford is a painter and illustrator, so they get it. Green continues on about how much there is to do in Niagara, how important the downtown revitalization is. Their artists can visit restaurants, shops, galleries, and cafes during lunch to share thoughts or be alone. On the subject of Niagara, Green says, “I wouldn’t have it any other way,” referring to both his Pelham home and lifestyle, and the advantages of having their business in Niagara. Cranford echoes the sentiment. Costs are part of it, as are amenities. Being able to buy their building, renovate and develop it as they wanted at a their own pace, would never have happened in Toronto. This cost structure, and pace of work and life in Niagara, really helps Keyframe/Krow-VFX maintain personnel. “We know some of our artists want to travel North America to work in the biggest houses, on the biggest projects, and we want them to try it and succeed. But many come back, and realize that the pace and care a smaller shop can give, and advantages of a smaller city, are beyond what the biggest can offer,” says Green. This combination of cost of living, wages, and benefits paid by Keyframe/Krow -VFX makes the Niagara equation work for their employees. “We might never have recognized it if we were still in Toronto,” Green says. The artists are a mix of young and old, male and female, and Green is proud of this. Asked about the technical computer skills required, Green took it back to the art. “We can train them on the computer skills, but our best artists have those qualities that translate into producing exceptional animation and FX. Composition, understanding light, timing, imagination—none of which depend on age or gender. When it comes to design and modelling, we have amazing female designers,” says Green. But in special effects, it’s still male-dominated, and Green doesn’t know why. Green says that they now have two in-house computer software specialists, and one of their main tasks is to re-jig the software to make it more artist friendly. An example is switching instructions for complicated animation or special effect tasks from words to pictures, making them easier to understand for visually-oriented artists. During a discussion about where their employees are recruited from, a simple question arises: Can the stereotypical kid who lives on his or her computer in their basement do this? Green explains they’ve had parents ask for a tour of the studio for their kids. He smiles and says two of the artists working for them now started this way. Keyframe/Krow-VFX provides a half dozen school tours a year, and Green has lectured at Niagara College, Humber, and Mohawk. As of now, most hires fresh from school are coming from colleges outside Niagara, but Niagara College is developing new courses and getting up to speed. Experience and the knowledge of what it will take to continue to excel has led the partners to develop their own intellectual properties and specialized software in-house. They are beta-testing a special effects program which they believe will take Keystone/Krow-VFX to new levels. They have done all the animation, start to finish, on projects for some clients, but haven’t written the script or owned the finished product. To date, all their movie work has been shared to some extent. Most television visual effects work has not been shared, except The Expanse, but they’ve never owned the show. For the first time, they have just finished a brand new Sci-Fi pilot of which they are 25% owners. Keystone/Krow VFX has earned some stability within the industry. Many shows they have contributed to have been long running, and are all or mostly all-Canadian productions. Warehouse 13 and Lost Girl have each run five seasons, The Expanse ran for three on SyFy, and Ollie has a coveted Saturday morning time slot on CBC. Amazon TV has finalized an agreement to pick up The Expanse from Syfy. The online service will schedule a fourth season of The Expanse—great news for Green, Cranford, and all the artists at Keyframe Animation and Krow-VFX.